New Delhi: President Pranab Mukherjee on Tuesday called for urgent steps to develop the textiles sector, saying its products are vulnerable to competition from cheaper imports and machine-made substitutes. He said there should be "concerted and collective" steps to safeguard the interests of the handloom and handicrafts sector, including facilitation of easier access to credit. Besides, he said, promotion of handloom and handicraft products in domestic and foreign markets and research for developing innovative technology will help the sector. 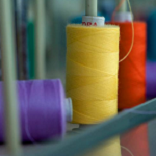 Mukherjee said: "It cannot be ignored that this (textile) sector despite its wide production base has been constrained in its growth. It has been disadvantaged by its inadequate access to credit, dependence on middlemen, inadequate availability of raw material, outdated technology and limited access to markets. The products in this sector remain vulnerable to competition from cheaper imports and machine-made substitutes." The President was addressing a Textiles Ministry awards ceremony in New Delhi. He said all these factors need to be addressed "urgently, systematically and comprehensively and we must give more attention to development of capacity, skills, designs and infrastructure". Elaborating on the measures to boost the sector, the President said: "We must take concerted and collective steps at multiple levels. These could include, for example, facilitation of easier access of these (handloom & handicraft) sectors to credit from banks and other financial institutions and the promotion of products of these sectors in domestic and foreign markets. "I firmly believe universities, corporate sector and Government departments can contribute by sponsoring - and themselves taking up - research that results in innovative technology to adapt and upgrade the traditional tools and designs of the local artisans, and weavers." Highlighting the importance of the sector, he said the handlooms sector in India, with 2.4 million handlooms, provides employment to about 4.4 mn persons while the handicrafts sector provides employment to about 7 mn persons.